We’ve partnered with our friends at Les Amis Du Fromage to offer a VCBW beer and cheese pairing! 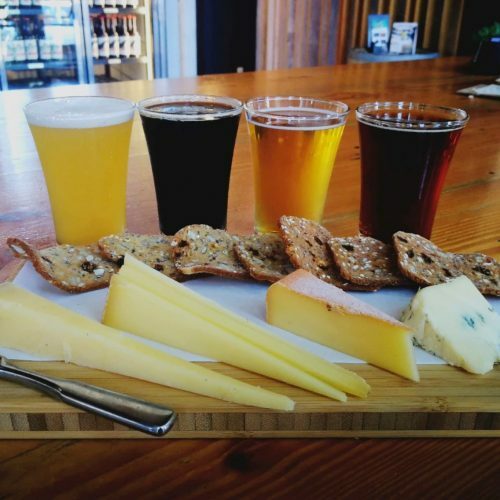 Iain and Joe Chaput (Les Amis Du Fromage) have put together a delicious line up for your sampling pleasure: a flight of beer and a flight of cheese! This set flight combo will be offered all week (while supplies last, no substitutions). A semi firm, buttery washed rind cheese from La Fromagerie Lehmann in Saguenay-Lac-Saint-Jean, Quebec. A hoppy and refreshing wit-IPA hybrid with stonefruit and citrus aromas. A classic brined blue made at the Abbaye de Saint-Benoit-du-Lac on the shores of Lac Memphrémagog. It is creamy on the palate, a little crumbly on the plate and has a great, briny, earthy finish. A tart and cherry-like barrel-aged oud bruin with subtle woody vanilla notes. A Swiss mountain cheese made from raw cow’s milk and it is brushed with white wine and wild thyme while it ripens. A smooth and rich imperial stout with elements of oak, bourbon, and dried fruits. An nontraditional cheddar made in Lincolnshire, UK. The cheese is made with a natural crust which is not usual for a cheddar style. The flavors that develop with this odd process are very grassy and interesting.